This documents focuses on the implementation details of BootTorrent. General details about the architecture and design can be found here. At power-on, the clients are limited in nature and the only supported protocols are DHCP, TFTP and PXE. So, client boot configuration is provided via DHCP, TFTP and PXE. None, our choices are limited by hardware. Dnsmasq implements various protocols such as DHCP, BOOTP, PXE and TFTP. It also includes scripting support via Lua scripting language. Three protocols: DHCP, PXE and TFTP are currently being used in BootTorrent. Implements support for DHCP, PXE and TFTP in a single package. Is widely available on most distributions. It has low requirements for system resources. ISC DHCP: Heavy, more suitable for large deployments. udhcpd: Doesn’t support PXE or BOOTP, part of BusyBox. Note: None of the alternatives support TFTP. Choosing any other option means that other external software is required for TFTP. bsdtar is a command line tool for reading and writing archives. bsdtar is used to create an SVR4 with no CRC (newc) type of archive containing additional client parameters and torrent metadata files. The archive created by bsdtar is directly mounted by kernel on the client computer as a standard initrd image. Note: SliTaz kernel only accepts archives in this format. With custom kernel compilation is possible to support other formats (which are supported by GNU tar) but that is a large compromise in: manageability, build creation times, approachability of project etc. HTTP server to serve metadata and configuration. Another server process is needed. Additional logic is required to handle on clients. Network broadcast to serve the metadata and configuration. Require another process on server and client both. Known for using high bandwidth sometimes. See Broadcast storm. Are sometimes blocked by network admins, see above. Sometimes the computers are isolated in their own VLANs. Needs extra configuration files to work that is avoidable on other approaches. Are geared towards creation of full initrd images. We only need to pack a folder. Archives are usable by clients without any additional software/logic. No extra process is created either on server or client. Aria2 is a BitTorrent client. Popular and available in most distributions. Many choices available: see Comparison of BitTorrent clients. Available as a package in SliTaz distribution. A new binary /sbin/bttui (BootTorrent TUI) is placed in client’s RAM disk. The new binary is loaded from initrd during boot process on TTY1 (configurable by phase1bootstrap/diff/etc/inittab) by the init process on the client. The login manager Getty (/sbin/getty) is also invoked on TTY2 and every other TTY is disabled. Changes needed to be made in the base image are numerous. Golang is a programming language developed by Google. It can easily create cross platform, portable, static binary executable files. System will load other drivers/software etc because proper init system is present. Less invasive. Single file need to be replaced on the base image. Avoids dependency management as the binary is static. Used GoCUI framework for the creating of CUI. Used YAML v2 library to read configuration files which are in YAML. This component runs on the computer that will serve the DHCP requests and act as a seed for the client computers in the network. The software parses the configuration files in the environment and then renders the final configuration file for various components from the parsed values and the template configuration files present in the package’s assets/tpls directory. These parsed configuration files are then written to the out/ directory inside the environment. The software also generates torrent metadata for all the folders present in the oss/ directory. Write configuration files for external components into out/ directory. Generate and pack the torrent metadata. Start the external components with final configuration settings. Standby and serve requests as they come. Aria2 acts as the seeder for all the torrents. Because client computers can unpack RAM disks in their early phase of boot, the torrents metadata is packed into a RAM disk on the host and is unpacked by the client computers on booting the Phase-1 Linux system. bsdtar is programmatically used to pack the client configuration and torrent metadata into a RAM disk. Dnsmasq provides both a DHCP server and a TFTP server. The DHCP server capability is used to prepare the client computers to start downloading the Phase-1 Linux system and torrent metadata from the TFTP server. The TFTP server serves the Phase-1 Linux system on the TFTP protocol widely used by most PXE implementations. Opentracker is an in-memory, standalone BitTorrent tracker. It allows fast discovery of other seeds/peers in the network (compared to LPD). It doesn’t need a database or configuration file. Includes integrated web interface to display statistics for the torrents being served. It is a YAML parser and emitter for Python. It is used to parse an BootTorrent environment’s YAML files. Jinja2 is a templating engine / processor in Python. External components use configuration files. Jinja2 is used to generate configuration files from templates and data models (such as passed variables, maps etc). Numerous: Visit Python’s templating documentation for information. mktorrent is a simple command line utility to create BitTorrent metainfo files. mktorrent is used to create torrent files for all the OSs present in the oss/ directory. This component (also called Phase-1 Linux system), which is downloaded via TFTP and runs on the client computers, is a 32-bit x86 OS and is based on SliTaz Linux distribution. Bitness of 32-bit was chosen to maximize compatibility with older hardware that may not be able to run 64-bit x86_64/AMD64 binaries. It is used to download the actual files from the torrent metadata. It is used to load any Linux based OS via kexec process. It is a hypervisor to run user provided non-Linux OS. It is used to provide Graphical display capabilities needed by Qemu. It is used to either accept user input and/or read client configuration and programatically calls above tools as necessary. PXE on client requests DHCP address. Client receives DHCP address + PXE configuration. Client downloads and executes the PXE Linux loader. Linux loader downloads and executes the Phase-1 Linux kernel and initrd(s). TUI binary is launched by the init system. OS to load is chosed either via user input or configuration. Download of the OS is initiated and saved to RAM. OS is loaded via appropriate method. It is a minimalist Go package for creating console user interfaces. It is a YAML parser and emitter for Golang. The BootTorrent executable uses env’s out/ directory as it’s working directory. It is cleaned before every run to remove any stale/old data. Boottorrent.yaml is parsed via PyYAML Python library and stored internally by the program into ‘config’ variable. ‘dnsmasq’ section of ‘config’ and assets/tpls/dnsmasq.conf.tpl are send to Jinja2 to get final configuration file for Dnsmasq which is then written to env’s out/dnsmasq/dnsmasq.conf file. Files for Phase 1 Linux system are also copied to out/dnsmasq/ph1 directory. For all the OSs present in the oss/ directory, torrent file for individual OS is generated via mktorrent binary and placed into env’s out/torrents directory. If Opentracker is enabled, it is added as external tracker to the torrents generated. Write configuration for the client TUI. TUI configuration is composed of two YAML files. These two files are parsed on the client to either display a TUI or load an OS. out/torrents/configs.yaml file stores the booting information for the OSs. out/torrents/Boottorrent.yaml file is a copy of env’s Boottorrent.yaml file. Generation of initrd carrying the client configuration. Client configuration is transferred to clients via an additional initrd during boot process. SliTaz kernel can unpack ‘newc’ type of initrd file. So, the env’s out/torrents directory (containing torrent metadata + TUI configuration) is packed into a ‘newc’ archive which is then mounted by the kernel on client during its boot process without any additional software. This new initrd is placed at out/dnsmasq/ph1/torrents.gz location. ‘aria2’ section of the ‘config’ and assets/tpls/aria2.conf.tpl are send to Jinja2 to get final configuration file for Aria2 which is then written to env’s out/aria2/conf file. The torrents are listed in out/aria2/list file which is read by Aria2 to load the torrents. At this point, configuration for these components is present in the out/ directory and these processes are ready to be launched. Note: Opentracker doesn’t require configuration file and its CLI is simple. So, it’s not written. Launch external components on the host. After the configuration(s) is written for components, they are launched and passed the path to their respective configuration. Dnsmasq is ready to serve any DHCP/TFTP requests. Aria2 is seeding the torrents. Opentracker tracker (if enabled) is ready to serve the clients. So, BootTorrent goes standby and waits for requests to come. When a computer starts and PXE boot is enabled in it’s BIOS, it will send a DHCP request to any DHCP server on the network and anticipate PXE booting information with the response. The DHCP protocol provides methods to instruct clients to launch a predefined PXE binary when responding with DHCP requests. These methods are used to launch a PXELinux loader (assets/ph1/pxelinux.0) on clients to prepare for the launch of the Phase 1 Linux system. Dnsmasq is configured to utilize these methods. SliTaz initrd containing all the drivers, programs, utilities etc. Currently contains only BootTorrent TUI. Contains the torrent metadata + the TUI configuration. It is updated on every invocation of BootTorrent on server. Once these files are downloaded, the PXELinux loader loads the Kernel. The init system on the SliTaz image then attempts to load /sbin/bttui binary which launches the TUI on client. 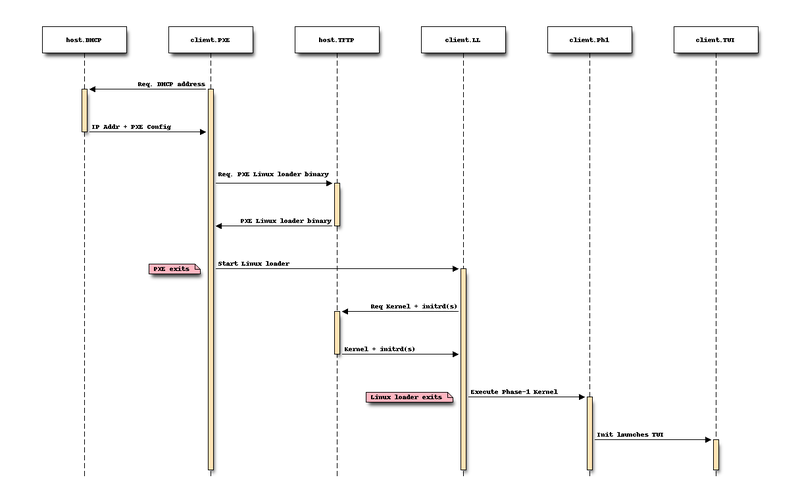 The below diagram illustrates how the booting process on client takes place. Note: The booting process starts with PXE on the client (client.PXE) and the vertical axis represents time. host.DHCP DHCP server running on the host. client.PXE Portable execution environment on the client.